Alongside 25,000 fellow FITBIT Miami Marathon runners, Team Friendship will conquer mile after mile of famous Miami tropical views! Friends, family and thousands of fans will line up along the 13.1/26.2 miles of roadways filled with inspiring sights and sounds to cheer you on. To get through the start line, participants will be able to use walkways until they close at 6:00 a.m. The 13.1/26.2-mile course starts and finishes in the same general area. The race will start heading north in front of the American Airlines Arena. Gear check is located at the finish line,on Biscayne Blvd., three blocks south of the start line, on the north end of Bayfront Park. Please use the clear bag provided at packet pickup. Place your bib number sticker on the bag which was provided with your registration packet. Make sure your belongings are well-marked with your contact information. The FITBIT Miami Marathon is NOT responsible for damaged or lost items. NO BACKPACKS PERMITTED. The Team Friendship Cheering Squad will be located at the 11th mile mark at the corner of N. Miami Avenue and NE 15th Street. The finish line is located at 301 Biscayne Blvd., Miami, FL 33131. After finishing the race, celebrate with friends and family at the Team Friendship charity tent located just past the finishing line. Port-o-lets and facilities will be located toward the front and back of the start line as well as in the American Airlines Arena. The time period for the marathon is historically among Miami’s driest and coolest time of the year. Nevertheless, we recommend that you please plan and prepare accordingly. Miami’s tropical weather can be humid, warm and wet. Average start temp in the low 60s. Average noon temp in the mid 70s. In order to comply with city permits, the roads will reopen in a graduated fashion. We require that participants be properly prepared and trained to complete the full marathon (26.2 miles) within 6 hours (14 min/mile pace). However, the full marathon finish line will remain open for 7 hours (16 min/mile pace). Please note that after the 6-hour pace, participant support (e.g. aid and water stations, volunteers, course marshals, clocks, etc.) is NOT guaranteed, and you will be required to adhere to local pedestrian rules (move to curbsides, break down lanes, sidewalks, etc.). Medals and official finish times will be given to all finishers who complete the race within 7 hours. Full Marathon participants must reach the 12.8-mile mark within 3:15 in order to be allowed to continue. The cutoff times are based on chip time, not gun time, in consideration of the additional time it takes the start corrals to clear. These cutoff times are also based on industry benchmarks; a majority of the races throughout the U.S. implement similar policies. See a video of the entire course below. More race-day questions? 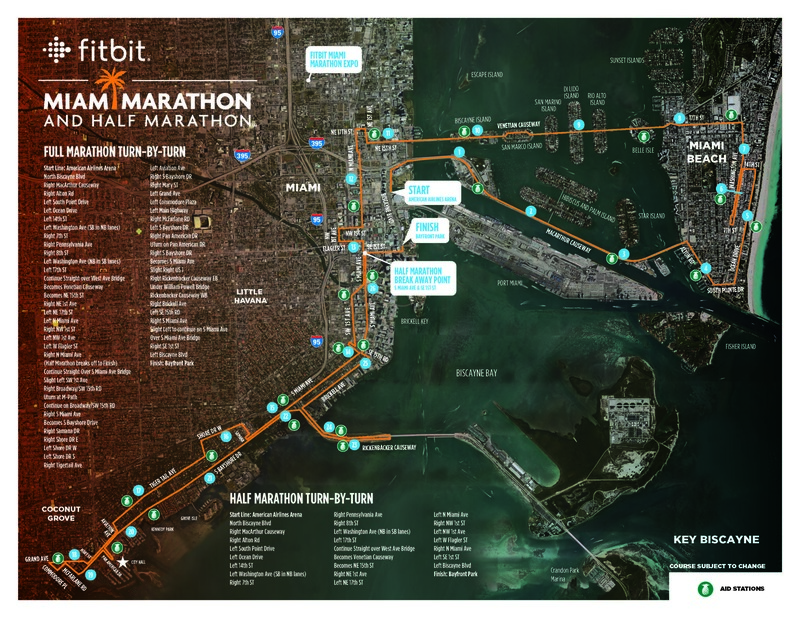 Visit the FITBIT Miami Marathon site for a complete race day guide.